Laser Processing Head HIGHmodular NEW! II-VI‘s new laser cutting head meets all requirements for flat sheet cutting: productivity, reliability, serviceability, and connectivity. The opto-mechanical system has been designed for extreme high powers and 24/7 operation in industrial environments. Our even faster new zoom-optics, with its extended and infinitely variable adjustment of focus diameter (M) and focus position (Z), enables outstanding cutting performance over a wide range of materials and thicknesses leading to maximum flexibility and productivity. New features prevent contamination to ensure high reliability. Integrated sensors offer a superior level of embedded intelligence providing condition monitoring and maximizing uptime. Welcome to the new generation of laser cutting heads. 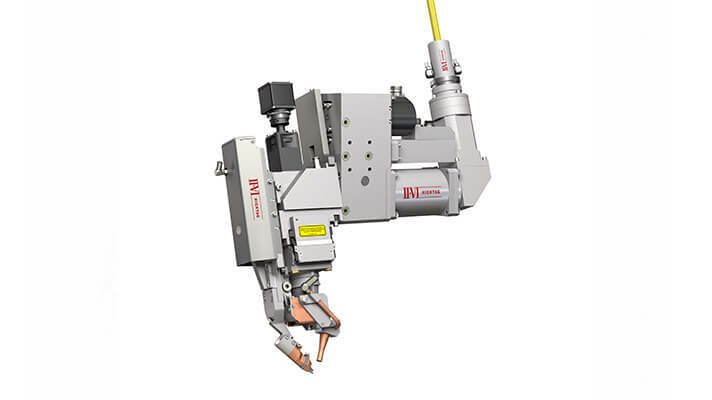 The HIGHmotion 2D is a remote laser welding head optimized to produce high quality and highly reliable welds on Aluminum and Copper connections on batteries used in electric vehicles. The system is rated for 6 kW average laser power in continuous wave operation and is optimized to withstand back reflections that are typical when welding highly reflective materials. The advanced optical design enables excellent imaging quality by minimizing thermally induced focus shift. Equipped with a II-VI F-theta lens, near-orthogonal welding angles can be achieved over a processing area of 200x300mm², which ensures that the beam can access the work pieces around complex and narrow clamping devices used in battery welding. 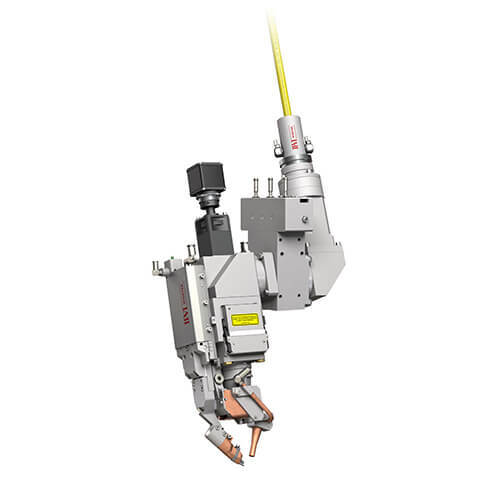 The HIGHmodular is a highly flexible processing head that is typically used for laser welding including battery welding for the automotive industry. It is designed with an embedded control unit that can be programmed through a graphical user interface (GUI). The HIGHmodular’s ability to continuously adjust the focus diameter and position on the fly, not only from one workpiece to the next but also during the joining process, takes software controlled welding to a whole new level of flexibility and productivity. Maximum flexibility for focus control is achieved with an integrated 1D scanner, zoom collimation and a broad array of optics expansion modules. 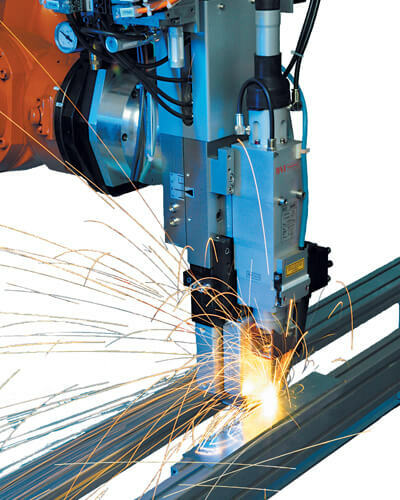 These features enable a near-limitless range of highly optimized laser welding tasks at a broad range of materials including aluminum, copper and steel. Continuous adjustment of focus diameter (M) and focus position (Z) at a focal length of 50 to 120 mm and Z working range of 40 mm. These are the properties which allow the II-VI PDT to tap into applications for time- and cost-saving laser brazing and welding. With this self-controlled laser machining head, it is possible to utilize rational laser technology without technological effort, e.g., for welding trunk lids, for roof and sealing duct brazing or for brazing and welding overlap joints (fl ange welds and fi llet welds). 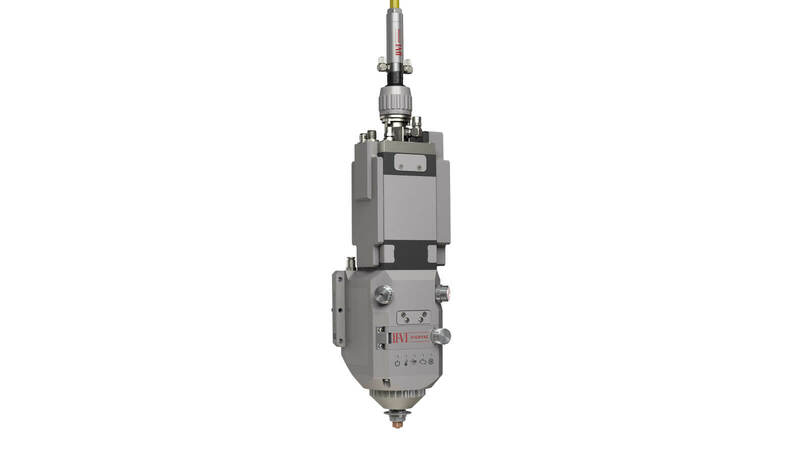 The problem-free use of the PDT is based on a tactile servo motor assisted seam tracking, which is integrated in the machining optical system. This involves a tactile sensor fi nger, optionally with or without a wire, via an optic-mechanical rotary motion that is directly coupled with the focus guidance system. This industry proven technology make the PDT fi rst choice for highly dynamic 1 μm laser material processing applications such as body-in-white welding. The processing head can traverse the laser focus to the precise welding or brazing position and then safely and accurately guide it over the workpiece during the process. This compensates for tolerances of the component part and inaccuracies of either the programming or the handling machine. The path can remain unchanged, thus signifi cantly simplifying control. With the help of a PC-based user interface, a parmeterization of the head (control functions, inputs and outputs) is possible. Today, lasers are not the cost determining factor in a laser application and a laser system installation. The efficiency of modern diode, fiber and disc lasers has shifted the cost contribution to the accessories and the system integration. The new laser processing head PDT-B follows the laser's exemplary trend by providing the essential seam tracking and auto focus functions using an unmatched cost-effective design. One of the most important requirements of the laser application is to locate the focus of the laser beam precisely at the defined seam position. The patented technology of the laser processing head PDT-B handles this task in an amazingly simple manner. 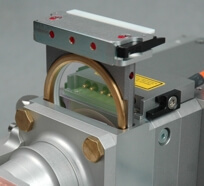 A tactile sensor which is directly located in front of the laser focus controls the lateral and vertical beam position and therefore guarantees the correct position on the workpiece. As a pioneer of the third dimension, the laser processing head RLSK sets new efficiency standards for laser welding. 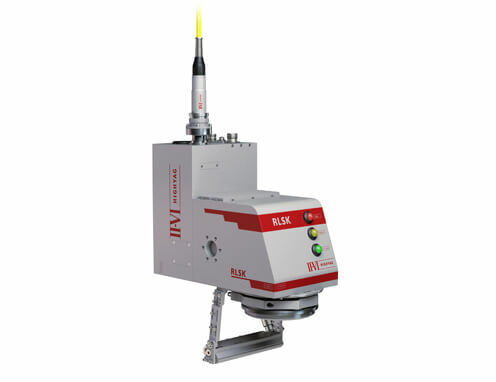 The RLSK combines the advantages of the remote laser welding principle: a large working distance and the capability to position the beam in a 3D work space. In its entire 3D work space, the RLSK allows beam positioning within milliseconds and it guarantees a uniform beam diameter. 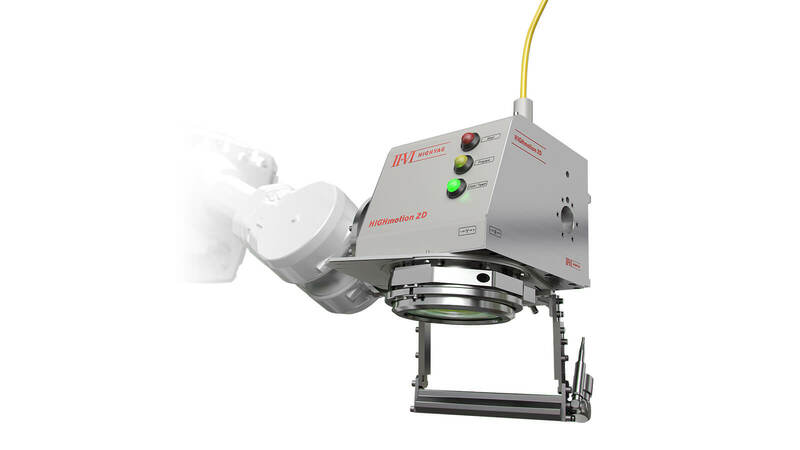 This 3D capability permits the remote laser processing head to accurately position the beam along high speed robot motions enabling short cycle times and a very high utilization of the laser and the robot. The RLSK uses scanner technology to position the laser light on the work piece. Two high speed scanner mirrors and a linear axis (which holds the collimation module) accurately position and move the laser focus in a 3D work space of 200 x 300 x 200 mm3 within milliseconds. The unique optical design of the lens systems for collimation and focusing of the laser beam guarantees a constant focus diameter for reliable process results in the entire work space. The integrated linear axis moves the focus position in the Z dimension and positions two additional laser pointer beams to the laser focus position. This enables offline and pre-programing of the welding process with pinpoint accuracy. The laser welding process can be observed and analysed online by coupling the imaging system of a CCD camera to the linear axis of the RLSK. The RLSK Studio software enables the user to leverage the capability of remote laser processing as well as setting up the entire process in an user friendly way. The precise positioning of the laser focus and the process features can easily be visualized using the RLSK Studio. The graphical user interface of the RLSK Studio assists in synchronizing the focus movement of the RLSK with the motion sequence of a handling device such as a robot. Editing process features such as seam shapes, welding speed, laser power, laser power ramping, defocussing etc. For high-quality welding connections of sheet metal packages one hundred percent reliability in focus guidance is an absolute must. This is ensured by the II-VI HIGHYAG RSK laser processing head. An integrated pressure roller or pressure finger clamps the workpiece and thereby simultaneously takes over the guidance of the focus position on the workpiece. With an infinitely variable pneumatically controlled force (max. 100 daN), the roller or finger runs over the sheet metal package, thereby precisely following the shapes of the workpiece. Direct coupling of the pressure finger with the focus achieves an “auto-focus control”, which significantly simplifies the process set-up. On the other hand, exerting counter pressure can also generate forces below the weight of the head, thus making a “weightless” welding process possible. 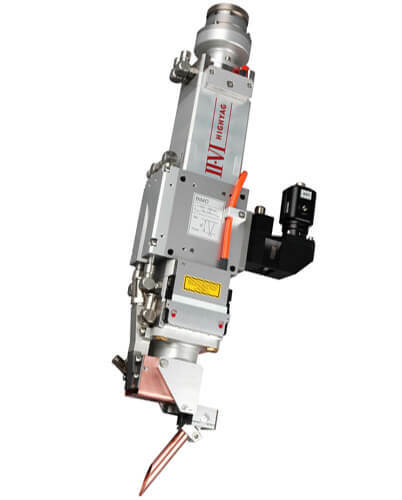 For clamping the sheet metal package on both sides, a clamping module with double rollers or double fingers is mounted on the pneumatic linear unit. This enables a clamping force of up to 100 daN to be achieved. 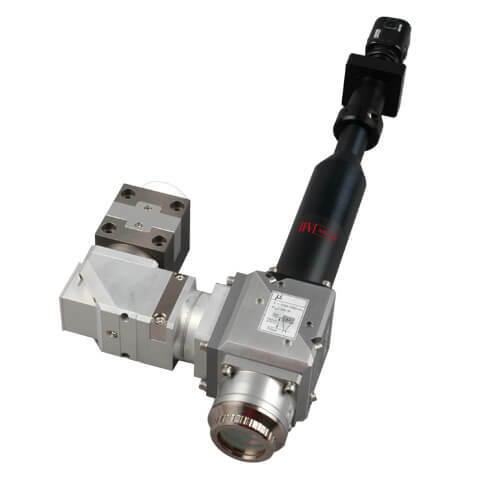 The proven focus heads BIO and BIMO, offering the advantages of a quick cover slide change and opto-electronic cover slide monitoring, are used for focusing the laser beam. The modular design of HIGHYAG RSK with head-mounted EPS allows customer-specific system integration and robot adaptation (with or without a crash sensor), a wide application spectrum and versatile, long-term guaranteed possibilities for retrofitting. A high level of investment security is therefore guaranteed. Micro laser material processing is playing an increasingly important role in flexible manufacturing. For innovative laser beam sources, including diode lasers as well as disc and fiber lasers, possible deployment scenarios are constantly expanding. 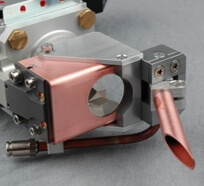 The flexible modular µ laser processing head develops the full potential of laser systems in the various job scenarios in micro laser processing. 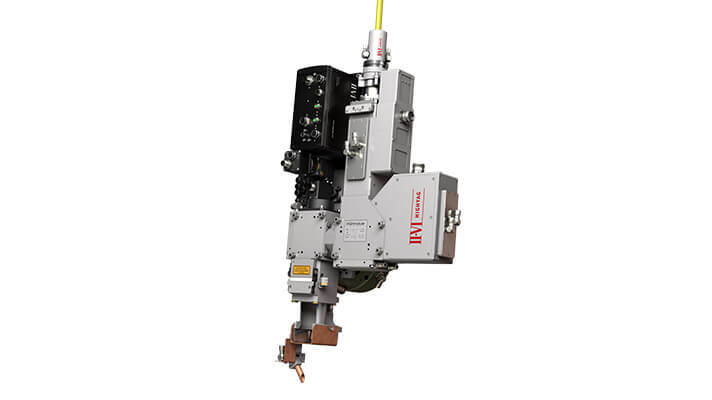 Apart from cutting in the single mode in order to take kerfs with a cut width of a few µm, the processing head can also be deployed in alternative optical configurations for plastic welding with foci in the mm range. For custom applications, process-supporting modules are available, such as cutting and shield gas nozzles for welding. Process monitoring modules are designed for process monitoring and set-up. When it comes to the combination of systems for image recognition and seam detection, optical interfaces are available that permit the imaging of the processed spot with a local resolution in the µm range. The modular system permits a universal mechanical integration of the head in laser processing facilities using the most diverse geometric parameters. In a word: µ laser processing head will set you up for any job involving micro laser material processing. Welcome to the new generation of the BIMO modular processing head, based on the proven laser processing heads BIO and BIMO thar have seen successful deployment in thousand of production scenarios. The innovative design comes in response to new laser light sources, from the diode laser to the disc and fiber laser, which have expanded the requirements for the optical systems of processing optics. While it masters these challenges , we made sure the system is of the same solid construction. It also permit safe, simple operation in 24/7 production then as now. Thus, the flexible, modular system of the BIMO laser processing head forms the basis for most tasks in laser-based material processing. The processing head can be configured in individual and modular ways. This includes simple tasks, like focusing the laser light onto the workpiece, as well as configuration of the entire turnkey subsystem of the laser processing head inside the laser cell.